ruthdelacruz | Travel and Lifestyle Blog : Do You Know the Sweetest Way to Die? Do You Know the Sweetest Way to Die? My mom is a little worried about my diet. Although I assure her that I try to eat healthier (by taking less salty and sweet food), she will always be the mom who worries about her kid's health (we are talking about a twen-teen year old kid here!). I cannot blame her, she is diabetic and she knows how hard it is to maintain sugar-level. She chose to not know what foodgasm and foodporn are all about. At home, we tried to do some lifestyle changes, starting with going with brown rice (instead of the usual white rice). Then probably (I need a little help and conviction from members of the family), Meatless Mondays. Diabetes in the Philippines is a growing health problem with 1 out of 5 Filipino adults has either prediabetes or diabetes. We are members of the high-risk ethnic population and our diet is accustomed to high levels of sugar content. Imagine, we eat rice, bread sweet potato, corn and other sugary food. Truth is, people don't die because of diabetes. It is the complications of diabetes that are fatal. Think of coronary artery and peripheral vascular disease, stroke, diabetic neuropathy, amputations, renal failure and blindness. Before one expect reduced life expectancy, there is an enormous health costs to shoulder. 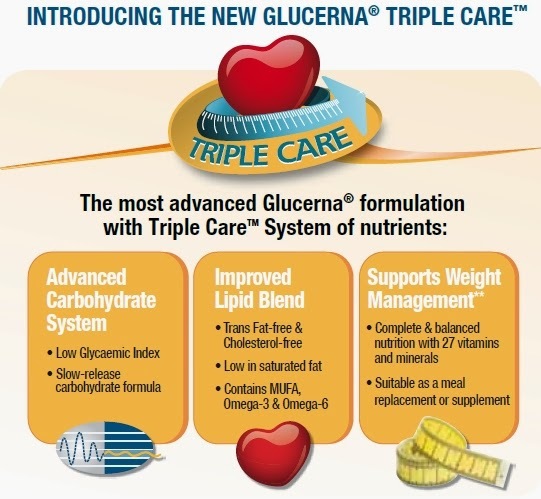 The good news, Abbott is responding to the growing worldwide diabetes epidemic by introducing Glucerna Triple Care. It is a specialized nutrition product for people with prediabetes and diabetes. Support Heart Health - unique heart lipid blend rich in MUFA and omega-3 fatty acides. Dr. Rodolfo Dimaano Jr, Medical Director of Abbott Nutrition shared that Glucerna Triple Care is the most advanced specialized nutrition product in the country. Each serving provides 225 calories per serving and 32 vitamins and minerals. I let my mom take Glucerna, and she is liking it. She might continue with the Glucerna plan. And while Diabetes offers a sweet way to die, we want to delay it. © ruthdelacruz | Travel and Lifestyle Blog : Do You Know the Sweetest Way to Die?